Lemguin Lunge is the twenty-fifth level in Donkey Kong Country 3: Dixie Kong's Double Trouble! and the fifth and final regular level of K3. Completing this stage grants access to Swanky's Sideshow (or Swanky's Dash in the Game Boy Advance remake) and the boss stage, Bleak's House. As its name suggests, Lemguins are featured throughout the level, including in both of its Bonus Areas; an indefinite number of these enemies spawn out from one of the eight holes in the level, and then slide at Dixie and Kiddy Kong. The Kongs must either avoid the Lemguins or bounce on them individually, the latter of which is sometimes required. The ground is slippery, which allows for the Lemguins to slide down quicker, until falling down a nearby pit. 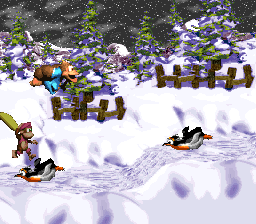 There are steep, bumpy slopes that give extra momentum for the Lemguins to slide down, although still making it harder for the Kongs to dodge the Lemguins. Aside from Lemguins, a few Skiddas also appear, along with a single red Buzz just below the first Bonus Area. Three DK Barrels appear in the level. 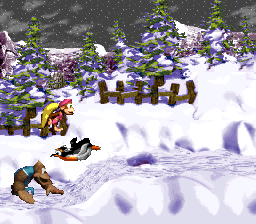 Lemguin Lunge starts with heavy snowstorm that slowly calms as the Kongs progress through the stage, similar to Ice Age Alley from Donkey Kong Country. The sky turns orange near the end of the level. The location of the letter O. When the level begins, the monkeys will make their way to a small alcove, consisting of a lone Skidda. They should dodge the enemy and continue on, where they will cross a small gap, grabbing the letter K. After landing on the other side of the gap, they will be confronted with several Lemguins sliding down the pathway. If they manage to get past the foes, they will make their way to another gap, which must be crossed. Walking eastward from the abyss, the Kongs will find another tribe of Lemguins coming at them. The monkeys should hop on a small housetop to dodge them, as well as grab the letter O. Farther on, they will pass the whole Lemguin group and travel over a small set of gaps. Upon approaching the third gap, they will meet the next Lemguin tribe. The penguins will get in their way until the apes tread up a few small hills and pass their hideout. After that, however, Dixie Kong and Kiddy Kong will find another group of Lemguins. If the heroes avoid all the enemies and race over a small gap, they will find the Star Barrel at the top of a hill. About halfway into the level, the heroes will slide down a hill to find the letter N and meet some more Lemguins. They should dodge the enemies and cross a small gap. Landing on a platform, they will need to defeat a lone Skidda and cross a second small gap in the area. Once this is done, they will encounter some more Lemguins. Following behind one of the penguins, they will soon make their way to another gap, one slightly larger than the previous pits. After crossing it, the apes will slide up and down a few icy hills, moving into the letter G at some point. Heading on, the group will pass another gap and walk up a fairly steep hill. Though this would normally be easily for the monkeys, Lemguins will slide down the same hill, trying to attack the Kongs. After getting up the hill, they will continue to dodge the foes, climbing over a rooftop to avoid getting hit. Soon, they will pass the enemies' hideout and head down a few stair-like platforms. Traveling a little farther from there, Dixie and her young partner will jump over a small gap again to reach a large and steep hill. As they climb this dangerous slope, the apes will meet more Lemguins, constantly getting in their way. Eventually, the Kongs will pass the foes and spot a flagpole. Raising the pole's flag will end the level. The first Bonus Barrel is located directly above the red Buzz at the start of the level. To reach it, the Kongs must use Team-Up carefully, where Kiddy must throw Dixie into the Bonus Barrel without her hitting into a red Buzz. In this Bonus Area, the Kongs have fifteen seconds to go up a hill and collect the Bonus Coin. However, there are Lemguins sliding down at them. The Kongs must bounce between each Lemguin before reaching the Bonus Coin at the end. A small house is located shortly after the letter G. The second Bonus Barrel is located below it, but there are Lemguins sliding past it. To reach it, the Kongs must go over the house and then run left, between two Lemguins, into the Bonus Barrel. The objective is for the Kongs to collect 30 stars under 20 seconds, but must avoid being hit by Lemguins sliding their path. The stars are located just above the ground, and the Kongs can backtrack to collect the stars they have missed. 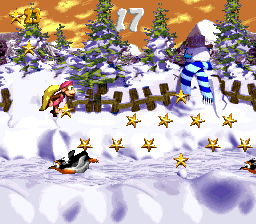 After collecting each star, the Bonus Coin appears at the far right of the stage. Floating above the first pit in the level, after the first Skidda. On the roof of a small house, about halfway in the level. On a downward slope just after the Star Barrel. After collecting the letter N, the Kongs must pass two more pits spawning Lemguins and a Skidda. The letter G is floating above the third and final Skidda of the level. Shortly after the letter O, Dixie and Kiddy can find the Koin guarding the level's DK Coin. The lead Kong must pick up a Steel Keg next to it and throw it to the wall on the left. The Kongs must quickly jump the other side, so that it rolls into the Koin's back, defeating it and causing it to relinquish its DK Coin. The Kongs jump at the letter G, located above a Skidda. The Kongs run to the second Bonus Barrel by running between two Lemguins. This page was last edited on April 10, 2019, at 13:34.